Finally, after years of toting around wines of the same vintage with cork and screwcap finishes, I opened a couple. The 2006 Castano Monsatrell used a plastic faux cork style closure before moving to screwcaps. They were purchased at the same time - within a week - direct from the distributor. The screwcap emerged mid-release and I do not know the treatment previous to release. Was it in tank? Bottled and then released? At any rate, the tasting amazed me. Remember that the grape is monastrell, Spanish for mourvedre, and the variety can be a bit funky and non-traditional anyway. I found the experiment surprising. The screwcap was bright, juicy and displayed some leather aromas with a spritz on the palate I associate with newly released, yet-to-settle wines. It was obviously fresh and tasted young. It was very bright and acidic. For all of my ranting about the fake, plastic corks I found this to be the superior bottling. The nose offered deeper and rounder fruits and the palate was softer and more enjoyable. Acid appeared but did not dominate as it did in the screwcap bottle. Darker, more purple fruit with leather underneath made for better balance and made this wine more subtle than the first. It showed completeness and maturity the screwcap did not. Although the final impression involved some of the prickly feel of the first it was all better integrated and a much more enjoyable wine. Tasting the bottles for three days showed no appreciable changes other than the normal degradation of wine. The screwcap remained intense and unpleasant while the faux cork version was the only one I wanted in my glass. The screwcap seemed to have frozen the bottle in time. Castano's wines need some time to breathe and evolve and only one bottling got that option. I am looking forward to the next round of experimentation. I will be putting together a full tasting this fall, if not earlier to explore further. I promise to keep updating right here. Schild's Shiraz Sequel - Shrewd or Scheming? The Wine Spectator's July 31st edition follows up on something I'm surprised we don't notice more often. Reported by the Spectator earlier, I don't stay glued to this computer reading wine stories so I miss some, Schild Estate in Barossa received a knock-out rating from the magazine and an exalted #7 in their Top 100 for 2010. With a reasonable price the wine sold quickly. They purchased and bottled 5,000 additional cases under the same moniker and vintage. The winery claims different labels; the Spectator alludes to having to prod them to do just that. Regardless, the "2nd Blend" strip label hardly suffices to clarify. As I understand it, nothing illegal has occurred here. Although how one can employ the word estate in the winery name and then bottle non-estate grapes and not violate some legal restrictions is completely beyond me. The label says Barossa and the second round is from Barossa. The vintages were both 2008. However, that's all the leeway I'm going to give them. The rest is pure greed and obfuscation, even deceit. I don't get many opportunities to use this word, but skulduggery seems wildly apropos in this instance. A review that can bolster the bottom line for years to come may indeed do exactly the opposite due to short-term selfishness and lack of scruples. The fact that the winery did not plan to export any of this second batch makes it perhaps all the worse. Maybe they told their Australian accounts of the new production but that may not get translated to the final consumer. Why not make a fun bottling with a completely other label to carry your fans through to the 2009 release. Sellout Shiraz or Substitute Shiraz or maybe even Stopgap Shiraz? They would have fun with it I bet and no risk to the winery of being found out would exist. In fact, positive press coverage might result, especially if the wine turns out to be solid. If, however, they intended to keep even those loyal to the brand in the dark then there should be severe penalties. This sort of resupply happens all the time with generic, inexpensive wines. It should never happen with an estate wine under any circumstance. Changing sources in mid-vintage is questionable practice but understandable for large producers. Yet another reason to avoid cookie-cutter wines. Rolling out a new blend in the wake of wild commercial success is about as underhanded as you can get. I have seen retail allocations disappear after huge reviews to protect loyal restaurants. I have seen wineries frustrated that they're out of stock when turning away long-time supporters. I have never seen a winery come up with a new wine under an old label to keep the pipeline full. Perhaps that's naivete on my part. The wineries decision was conscious and planned. In light of the review, "a decision was made by Schild Estate Wines to reallocate the majority of the 2008 Barossa Shiraz production to the US market," said Corey Mohr, GM of the winery, in a press release. I would be livid in the local market if a big review appeared and they sold that juice halfway around the world while coming back to me with an inferior product under a nearly identical label. The Wine Spectator finally had the ability to review the original and the sequel; "this second bottling (destined solely for sale in Australia, according to the winery) rated significantly lower than the original cuvee." July 31, 2011, p.55. This is like a concert promoter after a five day sold-out stand with a popular band adding two nights but offering a cover band instead. It's shameful and it reflects poorly on the rest of the wine world. Though the price to pay may be steep for this winery the damage done to reputable producers is incalculable. A website has entered the confusing fray of online wine sales. They entered with a splash and seem to be aggressively hiring and trying to carve a profitable niche in a challenging arena. The model is simple, but unique; tap into wines that may need exposure or may be gathering dust at the winery and offer them at dramatically reduced prices for short periods of time, sometimes mere hours. Many of the offerings arrive in my inbox with big point ratings, some are from top-notch producers and some I have never encountered. I checked all the prices for a few weeks and they are very attractive. Despite my fairly minor complaint about the twice-daily e-mails I have some serious concerns. Steve Heimoff discussed his issue of them using "glitter-by-association" by name-dropping a winemaker for a famous producer even though the wine on sale does not come from that producer. http://www.steveheimoff.com/index.php/2011/06/06/monday-meander-pinot-noir-and-lot18/ I have no issues with that as long as they make it clear. Mr. Heimoff also mentions his apprehension about the quality of the offerings and muses that Lot 18 may be a mere dumping ground for slow-moving product. That nearly goes without saying. No winery in their right mind sells wines to a discount retailer by choice. Beyond the obvious loss of immediate revenue the producer runs the risk of alienating their more traditional outlets. If I ran a retail shop and consistently supported a winery's pinot noir around $40 and my customers could get that wine for a day or two for $25, sometimes with free shipping, I would be tempted to never carry that wine again. Try being a wholesaler for that product, it may be offered below your price. I understand upscale producers face serious challenges in this economy but selling twenty or twenty-five cases and damaging other outlets is short sighted, at best. The major hurdle here is one I worry about routinely being in the sultry south. Half of the year is damn hot down here and can destroy wine in mere hours under the wrong conditions. Forget overnight shipping saving anything, deliver after noon in a non-air-conditioned truck and that wine is toast. I have not ordered from Lot 18 so I do not know their shipping procedures and do not mean to cast dispersions at them in particular. Shipping is challenging, I speak from experience. As a retail manager and salesman for more than six years we constantly concerned ourselves about heat and even had wine freeze one time when the shipper was unable to deliver before end of business on Friday and left the wine in a cold part of the warehouse. You also can not taste these offerings before buying. That is an e-tail specific problem for wine which has no easy remedy. It is a buyer's market, dig around a bit locally, you may be surprised what you can find, taste and transport all on your own. I drink very little domestic Chardonnay but have always appreciated Saintsbury's restraint and balance compared to many of their neighbors. A chilled bottle in the fridge and the easy screwcap access helped make this the right choice for a gathering. There would be grilled salmon with an olive aioli that should at least be able to shake hands and communicate with the Saintsbury even if they were unlikely to be best friends. Saintsbury Chardonnay, Carneros 2008 - The chardonnay comes from Carneros and usually displays a crispness and restrained use of oak. Malolactic fermentation occurs and there is some new oak (25-33%) but the French oak and cooler climate keep things from getting out of control. The wine is unfiltered and this 2008 (2009 current release) displayed a creamy, lemon nose with clear accents of oak - too much for me, but I'm picky. The palate was more of the same with some buttery texture. I found the wine disjointed and generally out of balance. I also thought it might have been acidified, the acidity seemed out of place, and it was way too sweet for me. It did not fare well as it warmed, admittedly my error for allowing it to reach that temperature. I need to try the 2009 to see if this was an aberration or if it is a sign of style to come. Fans of California chardonnay will be perfectly happy, but I was disappointed. $18-$20. Vesevo Beneventano Aglianico, Campania 2006 - From Campania, where Naples is located, comes one of my favorite Italian grapes, aglianico. It reminds me of zinfandel, with its bright fruit and drinkability, it retains a sensibility that is distinctly Italian which makes it friendlier with food. I served this with dry-rub ribs but it worked with the salmon mentioned above fairly well. The wine was smoky, with juicy red fruit and some flashy smoky note on the palate. The texture showed extraction, but not to much and the red berry from the nose expanded to show more purple fruit. I have never quite been able to describe the purple fruit thing, but if Kool-Aid grape (purple) could have been reverse engineered and turned into a fruit without out so much sugar that might explain it. Very fine tannin offered balance but most of the dryness came from acidity and minerality. The winery is named after Mount Vesuvius and the wines in the area derive lots of complexity from minerality created through decomposition of lava from the legendary eruption in 79 AD. This wine exhibits a balanced zinfandel-style and will work wonders with grilled meats. Keep this one handy this summer. Imported by VinDivino, $15-$18. A new restaurant has opened on Poydras St in an area mostly populated by drinking establishments that serve food. The area bustles when major events happen at the Superdome and lunch brings lots of potential action from the location in the CBD (Central Business District). Fine dining at night has not stretched successfully to this area. Enter a growing player in the New Orleans scene, LRG. They also run Republic (the bar/nightclub), Loa (International House's bar), Capdeville and Sylvain (restaurants). Their website describes the restaurant as, "an elegant, modern French restaurant inspired by the legendary Champagne houses of France...taking inspiration from renowned Champagne houses like Veuve Clicquot, Ste. Marie offers an extensive menu featuring six Champagnes and twenty-two sparkling wines from different locations, each possessing distinct flavors." 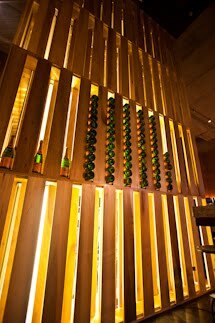 To remind diners of the importance of champagne to the restaurant they have constructed a champagne tower. http://www.stemarienola.com/ste-marie-champagne.html Every diner that orders a bottle of Veuve Clicquot gets an "orange paint pen" to autograph the bottle and have it placed in the tower for all to see. I assume the La Grande Dame bottling ($418) will be included but I'm sure there will be a lot more of the Yellow Label (I question my ability to see color every time someone calls this yellow - it's clearly more orange) priced at a more reasonable $110. Let me point out the level of import this will have for the ownership of the restaurant. If people buy into this concept it might just keep them around for a while. I guarantee Veuve Clicquot and/or the distributor, coincidentally named Republic...hmmm, is offering them free goods or a healthy discount for the devotion and the glass pour. I bet the incentive to the restaurant is significant. More power to them. Capitalism at work. Generate a need, offer the product to fulfill that, get it at a larger discount than others in the market and charge market rates. Pocket profits and enjoy. Please don't delude yourself into thinking that the featured champagne is unique or distinct any longer. Production numbers have increased significantly and, in my opinion - and I am not alone in this, quality has slipped. For comparison, Louis Roederer, a well-known producer - they make Cristal among others bottlings, uses about 320 hecatres (approx. 645 acres) to produce all their wines. Veuve Clicquot owns more than that (not a bad thing) but even their extensive estate vineyards (382 hectares) only account for about one-quarter of their needs. They are a huge producer of champagne and have lost any aura of uniqueness in the wine world. That being said, it still sells well because most consumers know it and are comfortable with it. The same can be said of McDonald's hamburgers, Abercrombie & Fitch t-shirts and USA Today. By all means, be one of those things if you want, but don't try to make me think you're something else. And don't expect me to be part of your customer base. Be LRG, but don't think you're really revolutionizing a lifestyle by featuring a champagne that can be found in convenience stores. Don't offer a wine that produces 600,000 cases of the Yellow Label Brut each year (that was nearly a decade ago, who knows where they are now) and tell me it's distinct. Maybe the location of the restaurant, sandwiched between a local chain pizzeria (Reginelli's) and a Jamba Juice outlet says it all. Maybe the restaurant shouldn't be called Ste. Marie, a reference to an old name for the neighborhood, maybe it should be called LRGLVMHVC. There's an alphabet soup that I have no interest in sampling.